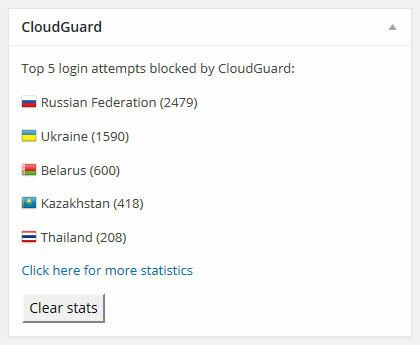 CloudGuard protects your login page against international hacking attempts. Country based IP ranges are updated regularly to provide you with a reliable protection. Webmasters also get to track login attempt statistics to make better decisions. CloudGuard doesn’t add extra overhead to your site and helps you reduce malicious login attempts. You need a CloudFlare account with Geolocation enabled to get started.